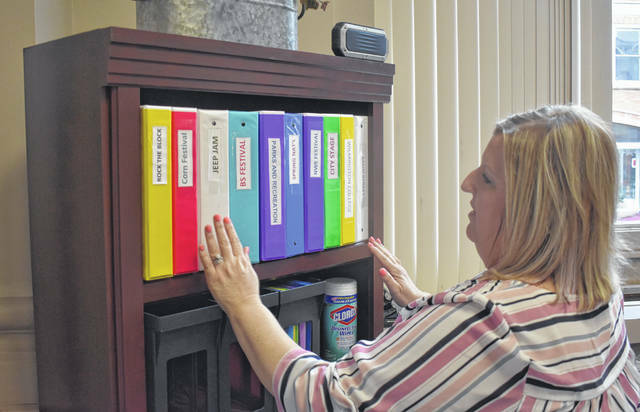 Susan Valentine-Scott looks over the work folders for the festivals in Clinton County this summer including the musical acts coming. Posters for upcoming 2019 events featuring music in Clinton County. WILMINGTON — Clinton County will be alive with music this summer. “There’s a lot!” said Susan Valentine-Scott, executive director of Clinton County Convention & Visitors Bureau. She told the News Journal about the acts performing at various festivals and events, including some familiar names and some newer, bigger ones. 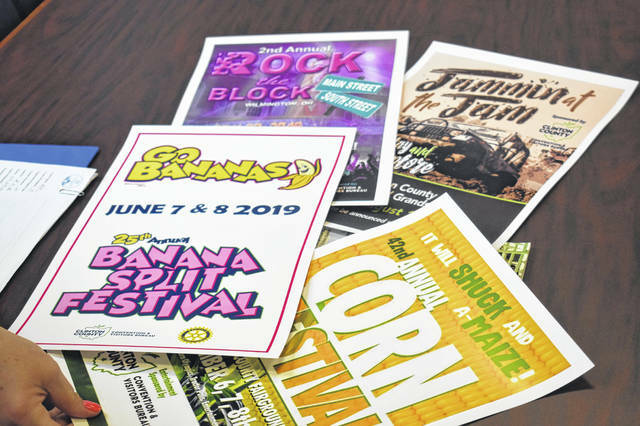 Kicking off the summer with the 25th Banana Split Festival on June 7-8 are Hadden Sayers, the Paul McCartney Project, and British rock band The Babys headlining the event. “The Banana Split Festival had done entertainment in the past, but never a national headliner,” said Valentine-Scott. The second Rock the Block on July 27 will have Reeking Havoc and Dirty Deeds: AC/DC Tribute Band playing in the pre-show on Main Street. Then inside, the Murphy Theatre will feature the bands Rockstar and ’80s-’90s hair-band Steelheart taking the 101-year-old stage. Jeep Jam on Aug. 16-18 will feature the country-rap duo The Lacs, country group Soul Circus Cowboys, and Dayton-based country singer Ashley Martin. One village’s party — Red, White and Blanchester Blue — will see some big names as well this summer. Cincinnati’s Blessid Union of Souls will play on July 3 with the Queen City-based dance group Naked Karate Girls taking the stage on the Fourth of July. Then wrapping things up in late summer with the Corn Festival from Sept. 6-8, Washington Court House’s Johnny Lawless will take the stage on Friday, and national country-rock band Confederate Railroad will finish things off on Saturday. Confederate Railroad is know for several hit singles including “Queen of Memphis” as well as two Platinum albums. “This is the first time the Corn Festival has ever had a national act,” Valentine-Scott added. The CVB has also been working with Spring Nationals and Over the Rhine’s Nowhere Else Festival, which is set to have its own list of acts converging on the county. Valentine-Scott told the News Journal they’ve invested over $300,000 into the county this year. “The biggest thing, with the ‘bed tax’ money we’re getting, is that we’re throwing it back into the community to support these events,” she said, adding that a lot of money has gone into reinvigorating the county’s stages. The expanding list of acts coming in also represents continuing growth in the area, she said. “Our job at the CVB is to make sure we bring people into our community and we give them a good experience,” she said. “That’s why we decided to invest into the festivals and to some other entities in the county, to show we want to help the growth, we want to help the economic development, and help support these festivals, which are long-standing and a big backbone to our growth,” she said. For more info on these events and others, visit the CCCVB’s website — clintoncountyohio.com.